When my editor first gave me the assignment of reviewing a Country Rap CD, I thought one thing—this dude is crazy! My editor and I have gone a few rounds of discussions about me reviewing things that are strictly in my comfort zone, which includes the genres of Pop, R&B, Rap and Soul. However, I didn’t make myself clear enough, because he wanted me to review a Country Rap CD! 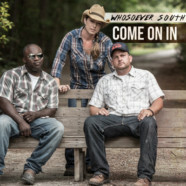 When I first heard the opening track on Whosoever South’s latest CD “Come On In,” I was quite surprised. “Come On In” the album’s title track actually was a warm welcoming song and introduction to the album’s overall theme. From the group’s sound, they have a strong emphasis and connection of what holds them together—their religion. One of my favorite songs on the album is “Get Down.” This song hands down will take you back to the Lil Jon crunk day’s era! In fact, while listening to this song I forgot I was listening to a Country Rap group! This song will truly make you want to shake something. The album does take an inspirational turn with “Survive” as it offers some encouragement when dealing with some of life’s most stressful moments. To continue with the encouraging mood on the album, “Living Water” pays homage again to the group’s roots—God. Come On In was overall a fun inspirational album. I honestly didn’t know what to expect before pressing play for the first song; my ears certainly received a treat as this album opened my ears to something different and quite valuable. If your music ears are anything like mine, which are set in their ways, don’t be afraid to jump outside of your comfort zone for these 11 tracks. Although Country music isn’t my genre of choice, the Rap aspect did add a different twist to it, leaving me quite impressed. Whosoever South teamed up with top-notch producers for this album so you can be assured the sounds will be glorious to your ears. Regardless of your music taste, “Come On In” is certainly worth a listen. This trio has a bright future ahead of them and with the continued help of top-notch music producers in the industry, this group will make the crossover between underground and mainstream in no time. This group will also continue to be relevant due to the fact they have an innovative and creative flair by mixing country and rap altogether. Without further ado, give this album a try and thank me later!